We had 24 players for a pleasant if slightly chilly day's croquet. 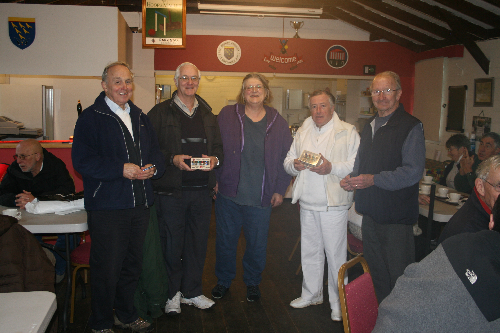 The winners were Jeff Rushby and Alan Rew who beat Keith Slatter and John Gosney to 1st place. Thanks to John Gosney for preparing 6 lawns for the event and to Chris Constable for managing it and providing the soup and roll lunch - delicious even if she couldn't quite remember what was in it!